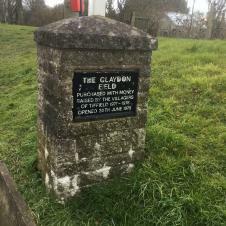 The Claydon Field is the name of our recreation field. The entrance is in Eastcote Road. 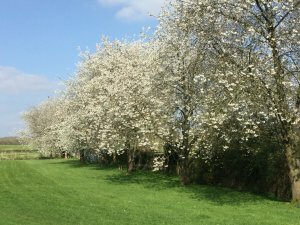 The field was purchased by the residents of the village from Mr Claydon, who was a local farmer, after they had organised many fundraising events between 1971 and 1978. The field was officially opened on 30 June 1979. The field is maintained by the Parish Council, and the volunteer warden is Mr Gordin Bradley. There is a children's play area, with swings for toddlers and for older children, a slide, some balance beams, and a new play tower which was installed in 2017 with proceeds from the Village Festival. In addition, new goal posts have been purchased for the field, and refurbishment of the wall and basketball hoop is planned for 2018. The field is also the site of our spectacular annual bonfire and fireworks display, which is renowned for its music, lighting, large bonfire and spectacular fireworks. This event always attracts visitors from the surrounding area. A very impressive Village Festival was held on The Claydon Field to cellibrate the Millenium in 2000, organised by Rae Spencer with a large team of volunteer helpers. The Parish Council then decided to hold another Festival on The Claydon Field in the summer of 2015. This was organised by Phyllis Power, and in spite of disappointing weather, the event was judged to be a success, and £1500 was donated to three charities – the local Air Ambulance Service, St John's Ambulance and the British Heart Foundation. In addition, a sizeable contribution was made to the Parish Council's Community Facilities Fund. It was decided that this event will be held every other year. The Festival in 2017 was bigger and better, and was again overseen by Phyllis Power, with Simon Loake organising the music and technical facilities and Steve Jowers and Jem Russell-Brown taking responsibility for the site. There were a host of craft stalls, exhibitions and displays from village organisations, and wide array of catering stalls, a real ale and cider bar, a wine bar, and a tea and cakes stall. In addition, there was high quality live music for almost ten hours. Plans are already being made for next Village Festival, which will be in the summer of 2019.